MIC-3022 is a 4U enclosure designed to host up to 8 CompactPCI 3U cards connected via a 32bit 33MHz or 66MHz PCI bus or serial bus. The chassis can be powered by PICMG2.11 CPCI power supplies or an ATX 400W power supply for cost sensitive applications. A CPCI power supply supports a wide range of applications in the industrial market requiring a robust, compact and reliable platform. Rear transition modules can be installed for each of the 8 slots to support I/O extension. The MIC-3022 enclosure is available for two kinds of backplanes; Legacy backplane provides up to 8 peripheral PCI slot while the hybrid backplane offers three PCI slots and four serial slots. 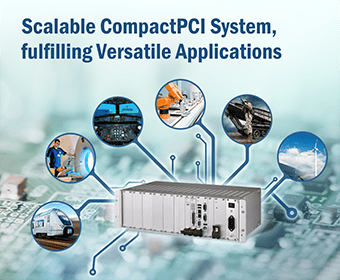 Being a hybrid system, it offers an uncomplicated and cost effective migration solution from parallel 3U CompactPCI® to serial CompactPCI® via the CompactPCI PlusIO standard instead of a bridge or an active logic. To save peripheral slots, there are two SATA connectors reserved on hybrid backplane by cable connection for storage extension. The chassis can be powered by PICMG2.11 CPCI power supplies or an ATX 400W power supply for cost sensitive applications. Four high performance fans provide adequate air flow to all slots, enabling system configurations which can be used in extended temperature environments. With the support of front swappable power supplies and add-in cards as well as a simplified fan replacement mechanism built in, systems based on the MIC-3022 can support a MTTR of 5 minutes or less.